The first priority for a Syrian arriving in a host country is registration in the United Nations High Commissioner for Refugees (UNHCR) ProGres database. Until registered, they are not officially a refugee, thus not entitled to protection or eligible for aid. Rather than using photos and fingerprints to verify a refugee’s identity, UNHCR has started to use iris scanning as verification. According to IrisGuard, the technology provider, 1.6 million Syrian refugees in the region have been registered in this way. Registration creates a global digital record for every refugee. The operation has been speeded up by using barcode scanners to scan each refugee’s Syrian ID card. 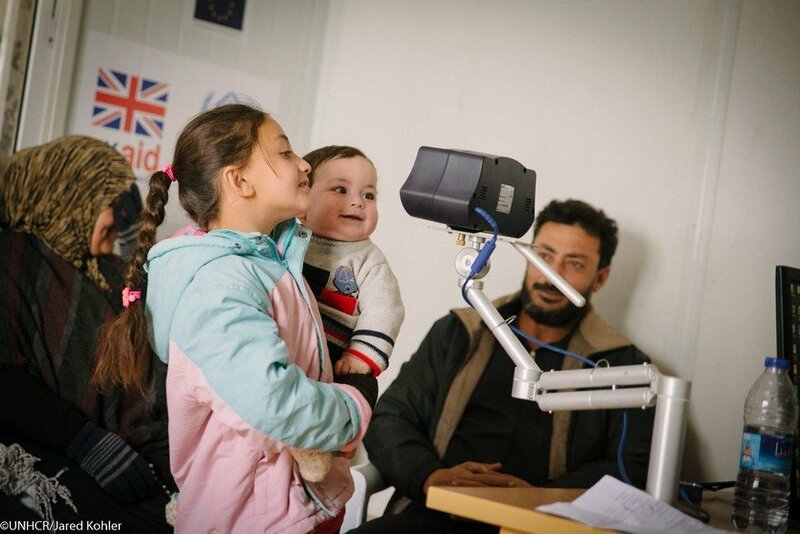 In this picture, A Syrian girl poses for an iris scan at the Zaatari camp in Jordan. Click here to read more details about how technology is helping deliver aid to Syrian refugees in the Middle East.